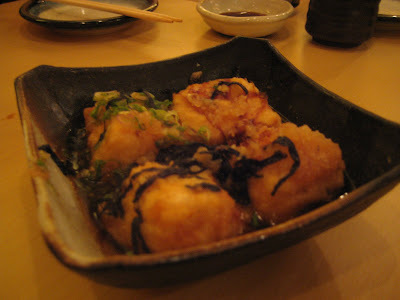 This past week, I went to Akashi with my parents for a simple dinner. 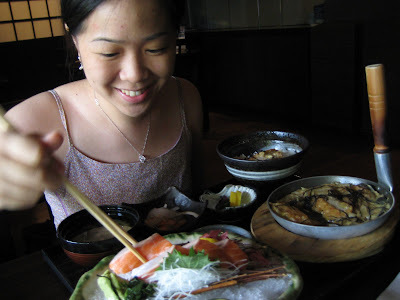 Akashi at Orchard (Tanglin Shopping Center) used to be one of my favourite casual places to eat and I used to go really often, in part because it was near B's house and he liked the place a lot. But by early 2007, I started to find that their prices were on the rise and the food quality hadn't sustained. 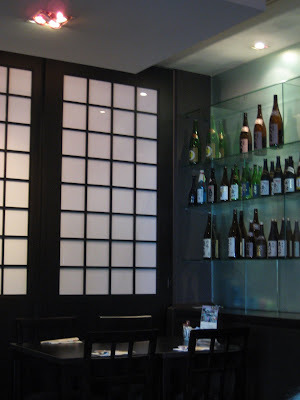 On good days though, it was still the place to be for home-style sushi and sashimi but at dinner prices sometimes north of $160 for two people, without any sake, it just seemed not really worth the long queue. 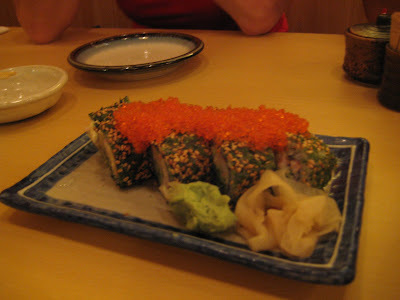 This particular day, the sushi was very fresh and good but there are a few 'off' items to be found on the menu, like the first picture, which was supposed to be steamed pumpkin. 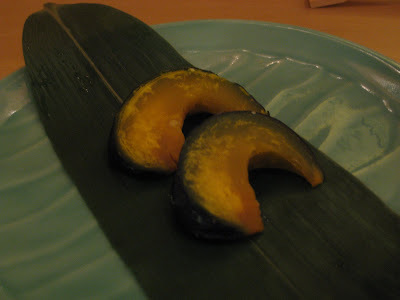 It literally came as two pieces of dry, grainy, half-cooked pumpkin. Atrocious. The thing about Akashi is that the sets are really quite good value. 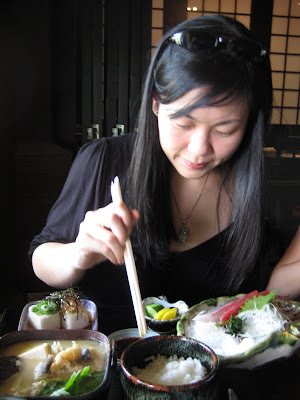 Ranging from $18-28, their sets encompass chirashi, sushi sets, sukiyaki sets and ricebowls with the usual eel, stewed chicken (oyakudon) and beef accompaniments. 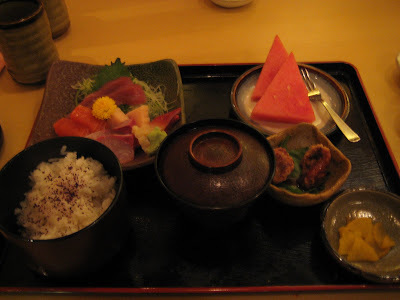 This is the sashimi set I had. I was quite upset that they have taken away their true-blue chirashi and instead replaced it with this awful rice with cubed sashimi offering. I think it's a bit of a cop-out because cubed sashimi doesn't need to be of the highest quality and you (as the chef-owner) can maximise your food usage. Personally, I think it's one of those things you can make for a good meal at home but it's a bit of a cheat to have it while branding yourself as an upper-class japanese restaurant. The atmosphere is still very good and it really seems like this new location, at Orchard Parade hotel, is working out for them just as much as the old one at Tanglin Shopping Center. This location has always been the best and the best performing, of the others, in Paragon and Vivo City. Congenial, welcoming chef-owner Mervyn Goh is still at the helm here and the service waitstaff is prompt enough, though still nothing near friendly. For my birthday treat, my "big siblings" took me to a Japanese lunch. 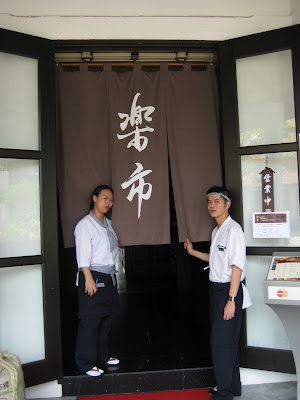 I was surprised to get the message that lunch was at Rakuichi at Dempsey Road, next to Prime Society. Although I remembered vaguely that there was a Japanese restaurant there but I had never stepped in. 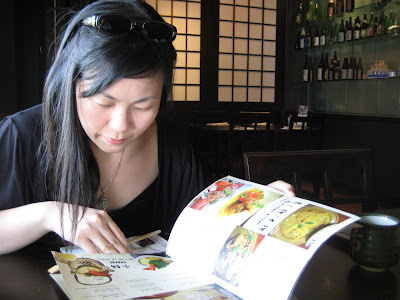 Still, they have unfailingly good taste in food, so I was happy to be invited. I discovered that this place is large and also quite sophisticated, if a little dark looking. For some reason, they had chosen to outfit the interior of a colonial style black and white barrack-turned-shophouse with a black wood interior and had installed knock-offs of the black fibreglass and epoxy mesh 2005 Bertjian Pot Random Light from Moooi (damn it, does nothing stay sacred from Balestier shops anymore?). We were shown to a window-side table but the light was still pretty awful, hence the sharp lighting yet blurry imaging in the photos. 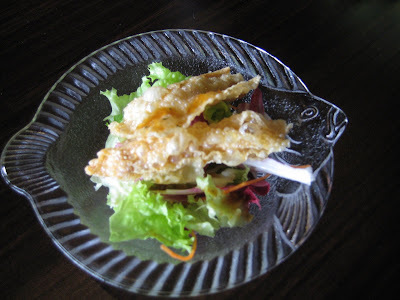 We started with a regular sesame salad but they had fried tofu skin and served the bubbly crackly skin with the salad. It was a good touch. The sets at Rakuichi are extremely good value. I've heard people say that the portions are small but to me, they are not. 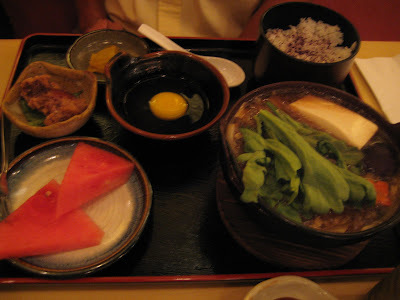 In addition, there are quite a lot of portions, there's the usual rice, salad and soup, but there's also chawamushi, a decent sized plate of sashimi and another hot dish, like oyakudon or gindara. Rather than serving watermelon, the set also includes sesame ice cream, which was very good. At $21 for most sets and with a 10% UOB credit card discount, I thought this was a pretty good deal. 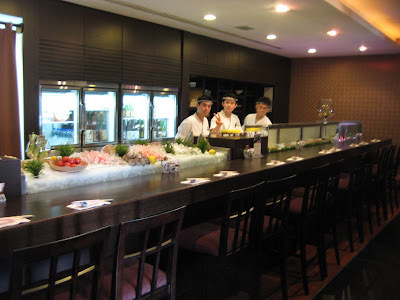 Some of the sets are more expensive at $28 and at $44 or $84, they have an ultra-set, more in the form of a full 8 course, Kaiseki-type lunch. I was quite full during lunch, so I felt like a comfort meal of a warm bowl of noodles and agadashi tofu. 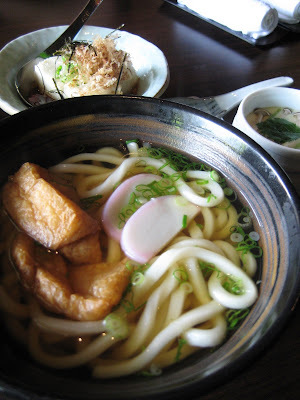 Their udon is a healthy size and the tofu skin in the udon, well perhaps I haven't had any Japanese tofu skin for awhile but this was the best I'd had in ages, soft, yet spongiferous and oozing soup through the tofu mesh. It was very satisfying. We also ordered some appetizer dishes and the chicken wings stuffed with aspagarus was very well-fried. 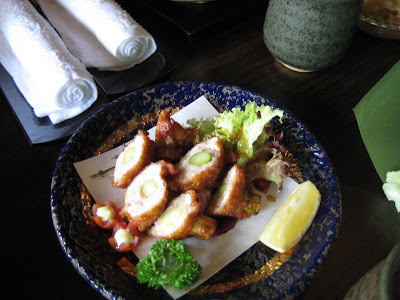 I think the one thing that pleasantly surprised me about this place is the refinement of the taste of their food and their cooking, especially in the fried items, their stuffed chicken was very tastefully executed, yet it wasn't oily and their agadashi tofu was not the anaemic kind that you get at Akashi.